Who's Responsible for Paying the Costs of a Car Accident? As the bills begin to pile up, many victims will worry about who is responsible for paying the costs of a car accident. 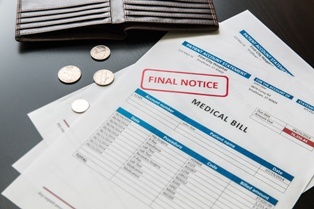 Although the at-fault driver’s insurance company is liable for the costs of a crash in Illinois and Missouri, hospitals and doctors may send bills directly to the victim—and even send these bills to collection agencies if the bills are not paid. When this occurs, victims have a variety of options for securing compensation. Unfortunately, victims may end up waiting several months for payment of their car accident costs. In fact, most insurance companies will wait until you have completed treatment for your injuries to issue you a lump-sum payment—and in the meantime, you may be subjected to endless phone calls from collectors or even be refused treatment by a medical provider. Health insurance. Victims will often use their own health insurance to pay for crash-related costs. This is a good option for a number of reasons: firstly, the bills will be paid on time and without restricting your access to care. Second, your insurer will keep detailed records of the amount paid to your medical providers. Finally, your health insurer will have a vested interest in getting the money it has paid for your care back—and will likely seek that money from the at-fault driver’s insurer, adding weight to your claim. MedPay. If you have purchased medical expense coverage (commonly called “med pay”) under your own car insurance policy, this can be used to cover costs. Although MedPay limits are often only a few thousand dollars, they may be used to supplement medical payments not covered by health insurance (such as copays or deductibles). Uninsured motorist coverage. If the other driver purchased minimal insurance or did not have insurance at all, you may use your own uninsured motorist coverage to cover your medical bills. The amount you can receive will depend on the limits of your policy, and your insurer may wait until the other driver’s insurance has been exhausted before they issue payment. Umbrella insurance policy. If you or the negligent driver purchased an umbrella insurance policy, you may be able to collect an additional amount for your injuries that goes beyond the policy limit. Vehicle owners. In Illinois, car accident victims can file injury claims against owners who lend their vehicles to irresponsible drivers. Parents can be held liable for a child's negligent driving if the child was performing an errand for the parents (such as grocery shopping or picking up a sibling), and friends may be liable for lending a negligent driver a vehicle if they had reason to suspect that the driver could cause harm to others. Employers. If the at-fault driver was performing services for an employer or driving a company vehicle (such as a pizza delivery driver running a red light), the employer may be held liable for the costs of the accident. Auto repair shops. Mechanics and auto body shops have a duty to repair vehicles in a way that maintains safety and does not impair reasonable road use. If a vehicle was improperly repaired, had the wrong parts installed, or suffered damage in the course of the repair work that led to the crash, victims could file a separate claim against the auto shop. Auto manufacturers. A defective auto part or dangerous vehicle design can make accidents more likely and the injuries sustained in the accident more severe. If faulty brakes, tires, seatbelts, airbags, or design elements led to an accident, victims may file a product liability lawsuit against the manufacturer. Bars and restaurants. In order to combat drunk driving, Illinois has enacted a “dram shop” law that allows victims to seek compensation from a business that over-served alcohol to an intoxicated person who goes on to cause a crash. If you or someone you love has been injured in a car accident, it is vital that you learn as much as possible about your legal rights. Download your FREE copy of our book, When the Rules of the Road Get Broken: A Guide to Illinois Car Wreck Cases, or contact The Tapella & Eberspacher Law Firm via our online contact form to schedule an appointment.